This was just the beginning of fun I had with POPSICLE last summer as I was their local spokesperson. Last summer was a true whirlwind for my brand, as I worked with so many different brands representing them on radio, television, in person and when I saw this photo it reminded me of the fun I had working with the Popsicle team in Pittsburgh. This photo was snapped when we were in Kennywood and in Garfield’s Nightmare, finding out that the tee would glow was just the icing on the cake. This is my story about working as the Popsicle Pop UP Party local spokesperson and what activities and ongoing occurred that day as I lavishly lived out loud and represented the brand. 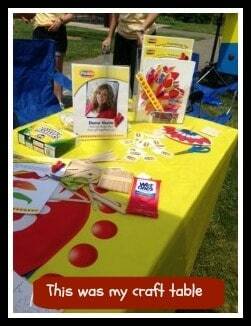 This summer has been a great memory maker for me, Pittsburgh Frugal Mom as I was most humbled when given the opportunity to be the local spokes person for POPSICLE Brand. Popsicle has worked its way across the USA with a Popsicle Pop-Up Party. Were they in your city and state? 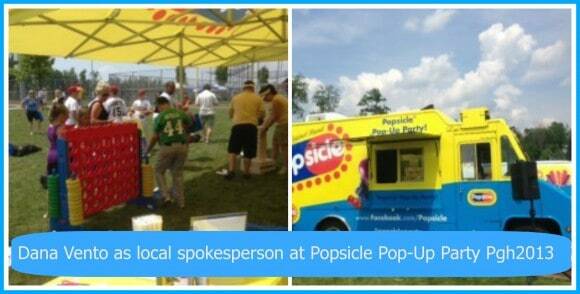 Here is a little bit about the Popsicle Pop-Up Party that I helped host in Monroeville in June. I think this sweltering day was about 100 degrees, no kidding and the sun was blistering. I remember because as I was all ready to meet and greet I personally felt like I might melt(lol). My Popsicle visor could not shield the heat and I kept wanting to feel frozen like a Popsicle. The cool Popsicles kept everyone in great form and they were a great cool treat for all those that enjoyed and we even had a few ‘return’ visitors. We were located on a ball field, where a ball tournament was happening and the guests we saw that day were from Pittsburgh to Canada and everywhere in between. The above photo is the cabana our guests sought shade under and played great larger-than-life games for prizes. The Popsicle Pop-Up truck had a great walk up window where you could get a Popsicle or 2 as many did enjoy. This was a great fit to represent because as I was formerly known as Pittsburgh Frugal Mom I was always looking for simple ways to provide great pleasure to my kids and guests. Popsicles are a great easy dessert or treat at any point in time during a day. Pulling out a few boxes of Popsicles brings on the fun. A few wrappers, sticks that offer jokes and kids that stick out Popsicle Stained tongues and you have an instant ‘cool’ party! As I alluded to earlier it was of course, one of the hottest days in our odd summer weather pattern, and it was the sunniest by far and with the sweltering heat. There is nothing quite like the great taste of a cool, fun-flavored Popsicle to take the steam out of the heat! Dressed up in Popsicle colors and a Popsicle visor, behind a table filled with crafts is where my story begins! A series of ball games were being played in Monroeville Community Park, West Entrance and all the little ball players were hot, sweaty and loving their FREE Popsicles that they received just for walking up to see us. Parked in an Bright Yellow Popsicle Branded Truck were an unending supply of juicy, fun-flavored, tongue-staining Popsicles, like Sour Patch Kids, Jolly Rancher, Hello Kitty Fun Bunch, Orange, Cherry and Grape and Swirlz! One by one a stream of over-heated little boys and girls, parents, grandparents, aunts and uncles came to the truck window and walked away happily with a delicious, cool Popsicle and quite a few of the kids and parents stopped by visit me and work on making Popsicle tiaras, fans, and Popsicle Stick creations. Some of the kids colored, and other kids got Popsicle Tattoos, but one thing that everyone walked away with were the great taste of cool, frozen, fresh treats and Popsicle famous colors! Our Pop-Up Party had great music, a Huge Connect 4 Game, photo opportunities, a life size ‘Jenga’ like game and treat bags. The bags had these great bouncy balls in them and all the kids kept coming up and asking for them. Behind my party table was a sidewalk and some little girls and boys made some great chalk creations on the walkway. The fun continued all afternoon long in the sweltering heat, until the very last Popsicle was handed out and the last tongue stained! Along the way there were a few casualties of Popsicles, a few tears and we managed to fix those right back up with Popsicle Replacement 101! The first rule of Popsicle Pop-Up Parties, no crying! The kids love the Popsicle sticks for the jokes on each and a few were collecting the sticks to collect jokes! It was a really a glacial cool brought on by a Popsicle Party. As the last Popsicle was handed out, and the last little twin boys team taped colored tape around Popsicle sticks creating 2 taped sticks and 2 large smiles, I knew my Popsicle Pop-Up Party had come to an end. That is my story of lavishly living life out loud, staying cool and hanging with the Popsicle Pop-Up team.